There are several tax receipts, for both royal and ecclesiastical taxations, which include valuations of the manor and the parish church. 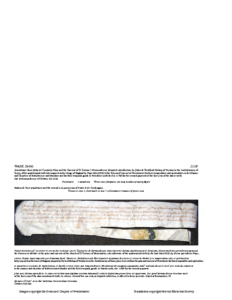 Two examples have been transcribed and translated below and the rest have been summarised here. Click on the links below to download the transcripts without images. Or click on the thumbnails below to download the transcripts with images. The transcriptions and translations are by Dr Shelagh Mitchell. The ‘Foreign expenses’ section of the Morden manorial account roll of 1290/91 records the ‘expenses of assessors of a certain tenth for the use of the lord King’.1 This probably refers to the lay subsidy required of the inhabitants of Morden. The ‘Foreign receipts’ section for 1294/95 includes, ‘The same renders account for 63s 8d for the tenths of the customary tenants’.2 This cannot refer to church tithes, as the rectory had not yet been appropriated, so it must be the tenth granted in 1294 to Edward I,3 collected from the customary tenants for forwarding to the tax collectors. In 1306/07 the ‘Foreign expenses’ section has the entries: ‘Also given to the 12 assessors of the thirtieth penny for the use of the lord King 2s. 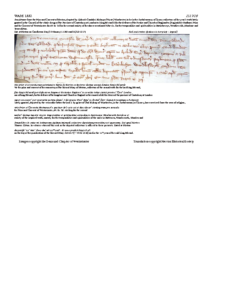 Also payment for the same 15s 6½d ¾d by 1 tally.’4 In 1306 twelve men from each hundred had been appointed, with the assistance of the reeve and four lawful men of each vill, ‘to make a true valuation of the movable goods possessed by the people on a specified day’, for tax assessed at a thirtieth in rural areas and at a twentieth in urban districts and ancient demesne of the Crown.5 However, conventional valuations were often made, all cows, oxen, etc being assessed at the same value irrespective of age, health, etc. Agricultural equipment, household goods and goods in the larder were normally exempt. This entry was posted in Resources, Manorial Documents, 08 Tax Receipts, Resources, Manorial Documents and tagged in manorial documents.